Home » SEO blog » Google Search Console » What is Google Search Console? 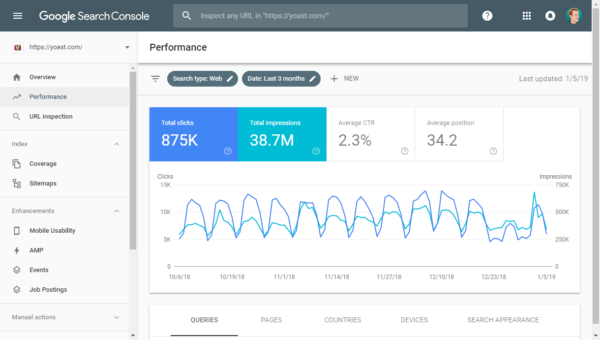 Google Search Console (or ‘GSC’ for short) lets webmasters monitor and manage their websites through an official portal, which is full of useful statistics. To have access to tools and data provided directly by the search engines can make optimizing your website much easier! But what is it, exactly? If you actively optimize your website, then you understand that SEO is never ‘finished’. You need to be continually improving your content, refining your site settings, and minimizing your errors. Search Console provides tools which help with this day-to-day management. 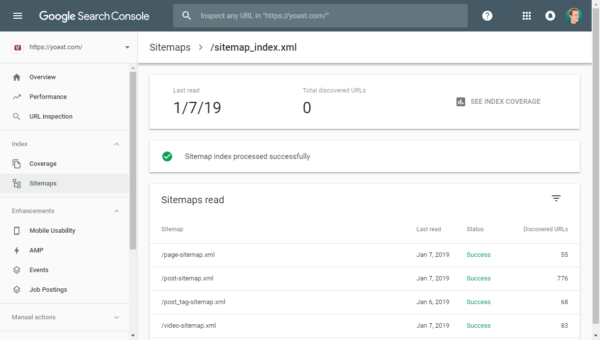 It lets you do things like submit and monitor your XML sitemaps, ask Google to (re)evaluate your errors, or see how Google sees particular pages and URLs on your site, for example. Your GSC account is full of useful information about how your website is showing and performing in search results. From mobile usability reports to visibility and clickthrough tracking, and much more. That means that, if you’re running a Yoast SEO plugin, you can integrate some of your GSC data directly into your website. 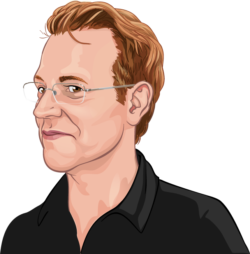 As a result, it can make it much easier to manage your errors, analysis, and redirects! And once you’re all set up, why not take a tour around Google Search Console with our great beginner’s guide? 16 Responses to What is Google Search Console? Thank you so much for this post, this post really helpful for newbie like me and many others. this is a great article. But I have a question, should we include all the form of a website like http, https, www, with domain name? And how it will help in google console? Please Explain..
Ah, you only need to include your ‘main’ version, which is usually the ‘https://www.’ version. If other versions are accessible (e.g., it’s possible to get to the HTTP or non-www versions with your browser), you’ll want to make sure that they all redirect to the ‘main’ version. If you have a HTTP profile and you’ve migrated to HTTPS (good work! ), you can safely delete the old HTTP profile. This is such a great article for beginners! Thanks so much for sharing. I agree Google search console is a very useful tool when it comes to optimising ur website in general. It’s a great piece of content but I would appreciate it if a future post carries in depth information how to use each of the provided set of tools for a website optimisation in the console dashboard. Again this is a very good piece of content. Well, I have some great news! 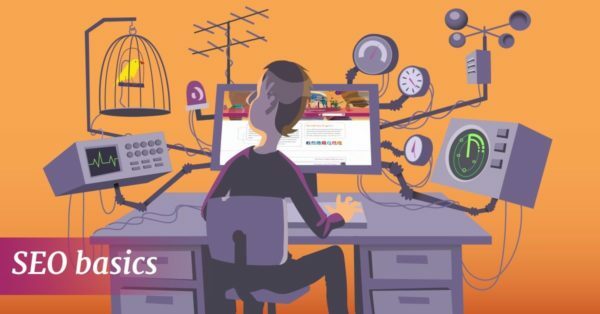 We have just such an article right here – https://yoast.com/beginners-guide-to-google-search-console/. Let us know if there’s anything specific missing from that, and we’ll make sure that we cover it! I would say i always get confused between google search console and google webmaster. If you could explain some differences between them, it would be appreciated. Actually I am a newbie in this blogging world. No problem! Google Search Console, as we’ve touched on here, is a platform which allows you to manage how your website appears in Google. It also offers some analytics/tracking/measurement tools. Google Analytics is a dedicated measurement platform which you install/run on your website, which tracks where your visitors come from, the pages they view, and the things which happen on the site. There’s some (and increasing) overlap between the two – you can see some data from Search Console in Google Analytics, for example – so the confusion is understandable! When setting up a new website does it matter in which order you set up Google Analytics, Google asearch Console, & Yoast plug-in? Great article. You have explained the functioning of a complex system in the most simple way. Looking forward for more such posts. Is Google console permit us to uploading robots.text file directly ? Or we need to do upload it via WebStrom. Can we use Yoast plugin in HTML website also ?